Prancing Horse with Head Turned, Eastern Han Dynasty (25-220 CE), detail. James E. Conley, Jr. Collection. Photo by the author. In 2005, as a senior Art History major at the University of Wisconsin-Milwaukee, I worked as an intern for the Museum’s Curatorial Department in Earlier European Art. Working under the expert intern-wrangling leadership of Catherine Sawinski, Assistant Curator of Earlier European Art, I industriously contributed my research (compiling artist biographies for the 2006 Biedermeier: The Invention of Simplicity exhibition) and customer service (answering public inquiries) skills to the greater cause of making the Milwaukee Art Museum run. Breaking my daily routine, Laurie Winters (now the Museum’s Director of Exhibitions) and Mary Weaver Chapin (now the Museum’s Associate Curator of Prints & Drawings) asked me if I could go to Chicago with Mary for the day to help with a cataloging project. We would be visiting an Asian art collection to inventory, measure, and photograph all the objects. As an intern, I was thrilled with this great opportunity, but I had no idea that this material would reappear in my life 6 years later! So….on that trip to Chicago way back in 2005, I got to see (up-close) James Conley’s collection, which is now featured in the Warriors, Beasts, and Spirits: Early Chinese Art from the James Conley Collection exhibition (June 11–September 11, 2011) in the Baumgartner and Schroeder Gallerias. 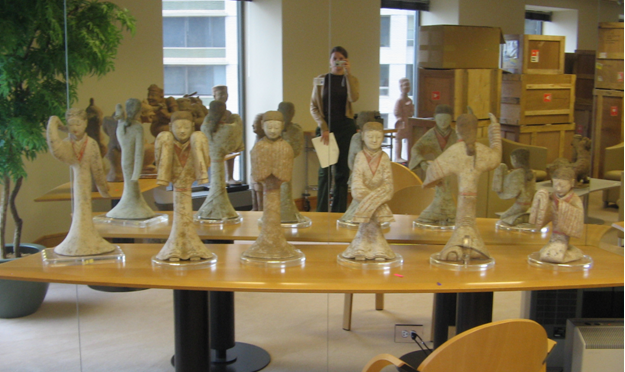 Me photographing Han Dynasty dancers in the James E. Conley, Jr. Collection. Fall 2005. Photo by the author. We traveled in style, like budget commuters (as all nonprofit workers do) on the Amtrak train, grabbed a quick coffee at Union Station, and walked over to Mr. Conley’s office where the artwork was stored. We were greeted and assisted by Mr. Conley’s very friendly staff. As we looked carefully at the art, assessing its condition and quality, it became obvious that these items were indeed rare and masterfully made. 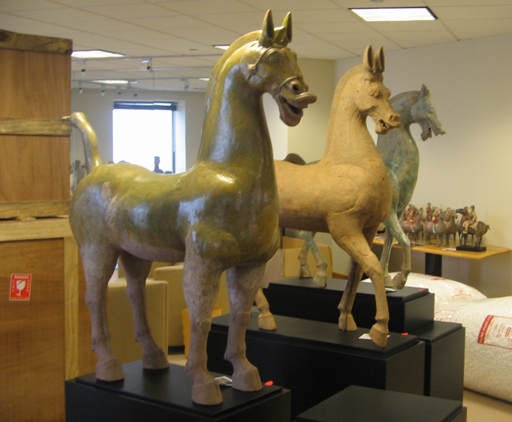 Earthenware Han dynasty horses, James E. Conley, Jr. Collection. Fall 2005. Photo by the author. As you can tell, it takes many, many years and a lot of work behind the scenes to do something that seems so simple (displaying art.) Bringing great examples of human ingenuity in visual art together with those who love it inspires the interns (like I was!) to keep plugging away at the envelope-stuffing and copy makin’ every day. If you’d like to intern at the Milwaukee Art Museum—and perhaps get a preview of an upcoming exhibition 6 years in advance—check out our available positions, or send your résumé with supporting documents, explaining your interest, to our Human Resources Department. I hope to see you in the offices soon! 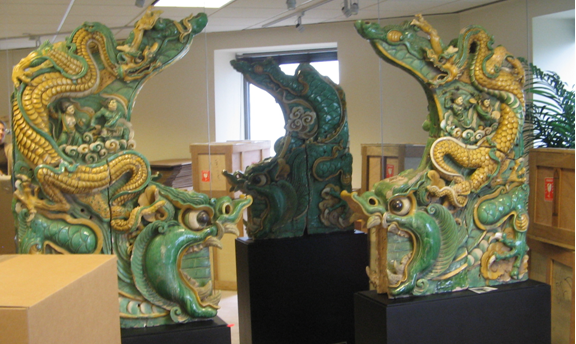 Pair of roof line ornaments (Chi Wen), James E. Conley, Jr. Collection. Fall 2005. Photo by the author. 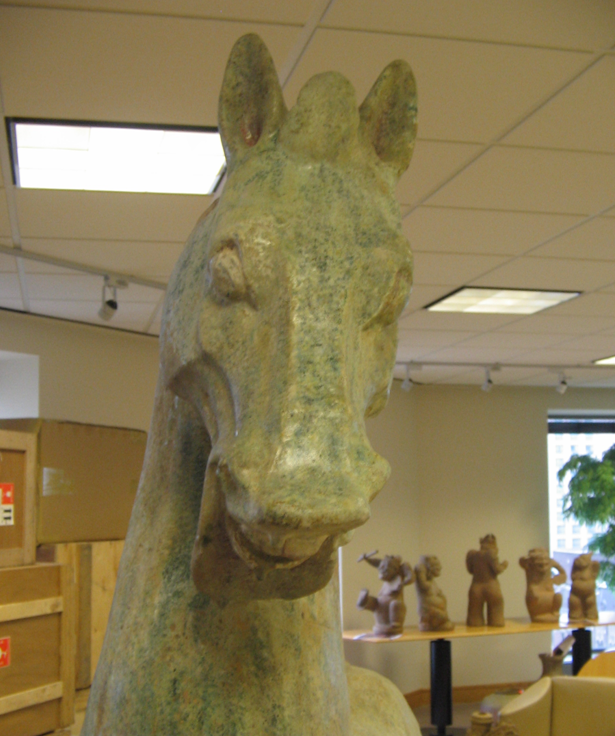 This entry was posted in Art, Behind the Scenes, Curatorial, Exhibitions and tagged and Spirits: Early Chinese Art from the James Conley Collection, Beasts, Behind the Scenes, Chinese Art, Exhibitions, Interns, Summer of CHINA, Warriors. Bookmark the permalink. Is that really all there is to it because that’d be flabbrgeastnig.